CZW Champion Shane Strickland Caps Off CZW Set 5! 2017 has been the year of Shane Strickland. This year in CZW he made it to the Best of the Best finals, and picked up wins over CZW legends Sami Callihan and Masada. King Swerve has won championships in multiple promotions in 2017, but perhaps none bigger than winning the CZW championship in July. He outlasted Davey Richards, Joe Gacy and Lio Rush in an epic 4-way to win the championship. Shane looks to continue his winning ways at Night of Infamy in a CZW Rules match against former champion Joe Gacy. But this champion is known for his high-flying talent, the charisma he oozes and his ability to adapt to any kind of match, so the odds always seem to be in his favor. 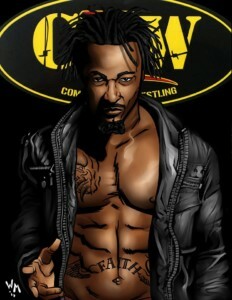 Shane Strickland joins Sami Callihan, MJF, Ace Romero, CCK and the Rep in the 5th CZW expansion. The game begins mailing on November 14th and will be available at CZW Night of Infamy on November 11th. You can pre-order CZW Set 5 right now by going HERE and the Shimmer Volume 5 game by going HERE. ← Holiday Explosion is Coming Next Month!